On February 3, after a few days of coaxing with watermelon and candy cane treats, Gypsy climbed into the PAWS elephant trailer for one final, short trip down the hill to join Rebecca, Annie and Wanda. moved into the barn on the other side. Gypsy and Annie were reaching out to touch trunks from a distance, but Rebecca moved right up to Gypsy and the two stood with the tips of their trunks touching for several moments. Rebecca hit the pipe with a playful blow at one point, startling Gypsy who fled to a far corner. Rebecca, who is the most subordinate elephant in the group, was surprised by Gypsy's retreat, and probably a little pleased. Gypsy returned after a few minutes, and the two spent time together, touching through the stall walls. Wanda came in later, and all four spent an uneventful first night together in the Asian barn with the elephant crew monitoring the socialization process. 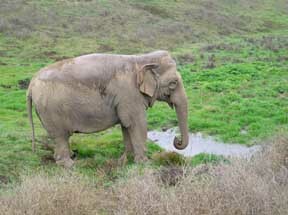 Tomorrow Gypsy will join the girls in the big habitat. 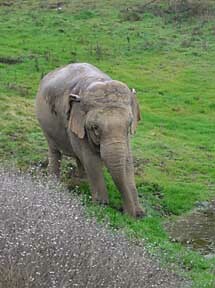 Nicholas spent his first night without Gypsy with the elephant crew keeping close watch for any signs of anxiety. Nic played with branches, ate and drank with no apparent distress. He slept for a few hours in the early morning until time to go outside, and continues to maintain his sweet disposition. His latest blood work confirms that he is beginning his first musth which accounts for Gypsy's aggressive behavior toward him. 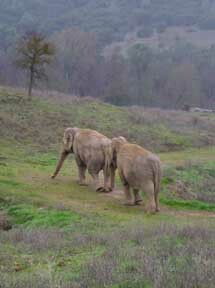 This is the beginning of a new chapter for Nicholas and Gypsy, and for the elephant crew at PAWS. So far, Gypsy is enjoying her retirement with the older girls, and Nic is loving all the special attention he is receiving from his human companions. 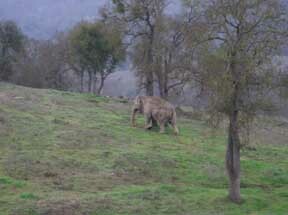 The strange relationship between the two would not have occurred in the wild; it is another sad result of captivity. We are all hopeful for a bright, happy future for the two as Nicholas becomes an adult and Gypsy retires with new companions. Soon Gypsy will go out into the big habitat with Rebecca, Wanda and Annie, and Nic will be enjoying his expansive new area which is under construction. When the construction is complete, Nic can wander down to the fence for a visit with the girls, and he and Gypsy can revive their very special relationship.